If you like to experiment in your kitchen, we have prepared you an excellent recipe for corn bread, which is not at all difficult to do and at the same time it does not increase weight. This delicious food, will most likely appeal to your household, and you can occasionally surprise other people with it. Cornbread is far healthier than regular wheat, which is caloric but it can be full of additives and it is not recommended to be eaten every day. People who are intolerant to gluten should be particularly attentive about what foods to eat, and therefore cornbread is a good choice for them. Fresh yeast - a piece of up to 50 grams. How to knead bread from corn? At the beginning stir both flours with salt, sugar and baking powder. In another pot boil 3 dl of milk and when it boils insert it into yeast and dilute it. When you do that add one decilitre of milk, but totally cold. Now the resulting mixture of yeast / milk pour into a mixture of flour. Lightly knead the dough. When you do this leave the batter for cornbread to rest for at least 60 minutes to rise. After one hour once again add a little mixture of wheat and corn flour and shape it into the desired shape. Unbaked bread of corn set in the appropriate pan, which you previously well-coated with a little oil (good practice is that you sprinkle a little flour on the pan as well). Corn bread is the best to bake in the oven for about 30 minutes. Regularly check the crust so that it would not burn. As soon as it is baked, remove it from the oven and wrap it in a cloth suitable for this purpose. When it cools down cut it into slices and serve to your family members. Cornbread will be a fine fit into any daily meal. There are several varieties to make cornbread. You can add the dough and other seeds such as sunflower, linseed, etc. 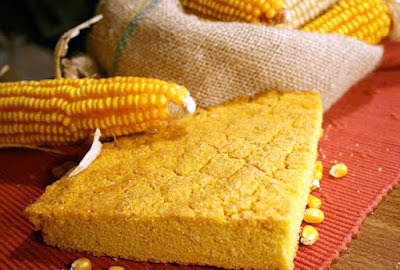 Note: If you make this cornbread recipe for the first time independently at your home, and you are not completely sure that it will appeal to your family members, friends or guests, the recommendation is to put less corn flower so that the proportion is 70 percent versus 30 percent of wheat corn. At total of 500 grams of flour, according to this calculation put 350 grams of wheat versus corn 150g. Over time, when you notice that nobody is disliking this bread, and that they like it, follow the original recipe. How else can you use corn flour for health? There are numerous benefits of corn flour for our health. In the first place it is good for digestion, it accelerate metabolism. Today it is possible to buy corn bread without gluten in health food stores which is very useful for people with celiac disease and is an integral part of their menu. More in the article celiac disease symptoms and treatment. If you struggle with gases, bloated stomach, you have very frequent diarrhoea, you are prone to allergies, feel tired after eating, start to consume bread made from corn flour instead of regular wheat, you will ease all the suffering in the short term, and you will feel much better. In addition to the homemade bread of corn, we recommend that in your diet be sure to include polenta. That the corn flour for weight loss is more than good we know from earlier. In 100 grams of corn bread there is total of 220 calories, which is somewhat lower than regular bread. Polenta is an even better choice for weight loss, but at the same time make sure that to the polenta you add only small amounts of milk or yogurt because they contribute to higher caloric value of food. Besides corn flour, boiled or roasted young corn cob, and homemade corn bread removes kidney stones, regulate the secretion of the thyroid gland, help with blood vessel diseases, diabetes, high blood pressure, and helps postmenopausal period. Read the recipe for corn bread lean. This healthy meal of corn also helps in diseases of the heart muscle, urinary tract infections, and back pain, cough - because they contribute to better discharge of phlegm, with atherosclerosis, bleeding and inflammation. Prone is an extremely effective cleaner of intestines and the same goes for the homemade cornbread.